Still Using Primitive Line and Bar Charts in Your Business? Line and bar charts are like an evening news anchor, they can only report what happened, but can't give you any insights into how or why it happened. With Pareto charts it's like a line graph and a bar chart had a baby who was smarter than either of its parents. Instead of a simple bar chart, Pareto charts sort the bars in descending order so that the biggest problems show up on the left side of the chart. 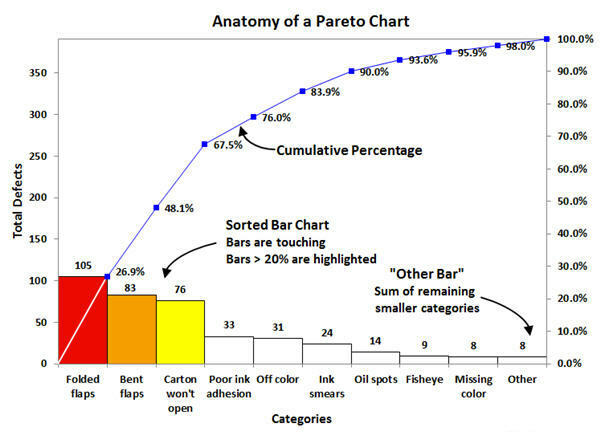 Instead of a simple line graph, Pareto charts use the size of each bar to calculate a cumulative line graph showing how much each bar adds to the overall problem. Often, two or three "big bars" represent most of the problem. If any of the first three bars is over 20% of the total problem, ChartSmartXL will color code them so that you can focus on fixing the biggest problem first. If you look at the example below, Folded Flaps, Bent Flaps and Carton won't open represent 67.5% of the overall problem. Analyze and Improve –the ChartSmartXL will do the math and draw the chart for you. Any bar that represents more than 20% of the total will be shaded. I really like ChartSmartXL. The Pareto chart alone is worth the purchase price. then click on the ChartSmartXL menu and Pareto. ChartSmartXL will perform the calculations and Excel formatting and will draw the Pareto for you. I have purchased ChartSmartXL and now amaze my friends and co-workers with the ease and speed of my Pareto charts and other stats. Is Your Business Sluggish and Error Prone? Too Much Firefighting and Crisis Management? © 2019 KnowWare International Inc. All Rights Reserved. Legal Information.